NOTE: Practice Subtraction from 18. 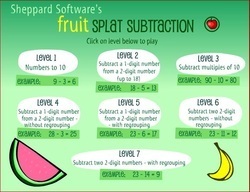 Subtraction facts to 12. Race up to 12 players. Subtraction facts to 12. 1 player. Subtraction facts to 12. Race up to 4 players. Subtraction facts to 12. Race up to 8 players.